It’s been a while since I highlighted my farm share contents. Lancaster Farm Fresh Cooperative is the source of most of my produce year round. 48 out of 52 weeks we get some sort of vegetable share and a few add ons. This winter I added an option that included one cheese, one pantry item and one package of meat every week. It is called the omnivore package. For those inclined, they also offered us a veganize option, which was bread, tofu and pantry item. This was a recent weekly selection and I want to feature it because I am so impressed with the Soom product. Locally owned in Philly. Sisters. Our co-op contracts with them. Besides their regular tahini, this week we got the chocolate version. Which is destined for a cookie recipe I found. Other local products have shown up as pantry items. Like this garlic pickle relish. I have been using this everywhere. In egg salad. Making a shrimp scampi last night. Mixed with some chili sauce to cover polenta which I then baked in the oven. 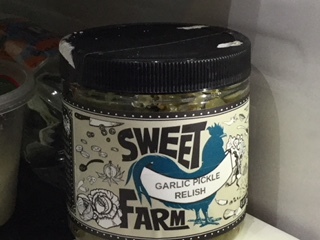 The Sweet Farm is located in Frederick MD. But the biggest surprise had to be the whole turkey legs last week. I kept thinking when I saw the email announcing the three items for the week that they can’t mean multiple legs. I thought “whole” turkey legs, really? Not drumsticks? Nope, they were whole turkey legs. Two of them. Total of 6.85 pounds. These were broad breasted black turkeys. A hybrid breed that can reach 40 pounds in weight. 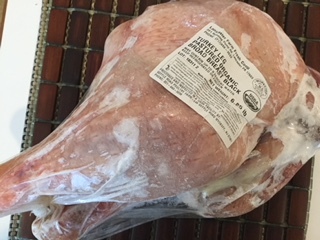 When I buy a fresh turkey from Maple Lawn Farms, I get a 12-14 pound bird. These legs were humongous. I kept them in the freezer because it looks like I will be grilling them. Together they would overflow my large roasting pan. I also think I may have to figure out how to separate them while frozen and only make one at a time. They are much too large to make soup. Thankfully, we both favor dark meat in turkeys. But even one of these legs will feed us for days. At about 4-6 ounces a serving and discarding the bones, there are easily 6 servings here. Any and all suggestions for what to make with these behemoths are welcome. All in all, I believe we are getting our money’s worth from the omnivore add on. We paid $26 a week for this share. The combined value of the products we received definitely exceeded the amount paid. We have gotten lamb, bison, turkey, chicken, pork and beef during the winter. We have gotten honey, tahini, sauerkraut, maple syrup, chocolate tahini, herbal teas, jam, dried mushrooms, AP flour, scone mix, pasta and that awesome garlic pickle relish. 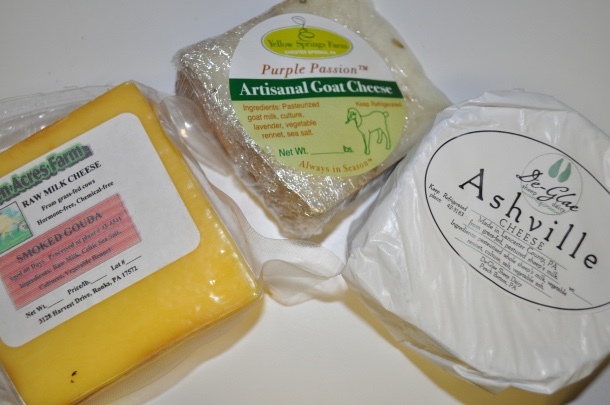 We get goat, sheep and cow milk cheeses – my favorites are the aged goat cheeses. I am about to begin my 9th summer season with the co-op. Still happy with the quality and the quantity. They also still amaze me with the occasional completely new produce item, even after all these years. Now, I just have to conquer those turkey legs. Posted in CSA, Food, Locavore, Local Businesses, Farms, LFFC and tagged CSA, Food, Locavore, foodie, real food, cooking, local businesses. Bookmark the permalink. It may be spring, literally, but for me it isn’t really here until the farmer’s markets and the Snowball Stand open, and until the fresh spring veggies arrive. For example, the arrival of asparagus in my yard and in my garden. And on my plate. Simple eggs and asparagus. A perfect brinner. Breakfast for dinner. My other favorites? Ramps. A trip to Silver Spring market in April will get me a few bunches to satisfy that spring craving. Another? Morel mushrooms. Usually found at Jenny’s Market, when she opens in May. Then there’s garlic scapes. We grow garlic at the food bank garden and we bring home the scapes since they aren’t an item the food bank wants. They make great pesto, mixed with almonds and Parmesan cheese. Saying farewell to root vegetables for a while and welcoming those vibrant greens. Herbs. Lettuces. What goodies would this inspire? A few side salads. That reminds me. Baby veggies. Micro greens. New potatoes. Scallions. All those things that we harvest while thinning the gardens. Time to put away the stew pots and bring out the salad plates. Posted in Food. Bookmark the permalink. Not my favorite time of year. Adjusting to the time change. I am working on so many projects and just can’t get motivated to get up when I should, as my brain keeps telling me it’s too early. Are you like me? Wishing they would just pick a time, one or the other, and stop the switching back and forth. You know, standard time is only four months long, and the daylight saving time is now eight months of the year. Why is the standard only 33% of the year? For us, we like to have dinner as the sun sets. We tend to be busy outdoors and come in for dinner when we have to stop working in the garden, or maintaining the property, or in my husband’s case, working on his antennas and towers. Enough complaining. I have to admit that today has been beautiful. Temps in the mid 70s. No rain. It all missed us. I headed into Clarksville earlier to do a few errands and I could see that the businesses are taking advantage of the weather. The windows are open at Food Plenty. I bet there are a few people already out on the patios. Maybe I should fire up the grill. After I move it back where it belongs. The wind storm a couple weeks ago actually pushed it around a bit. This may be just a short taste of the coming spring, but it is most welcome after a wet miserable winter. 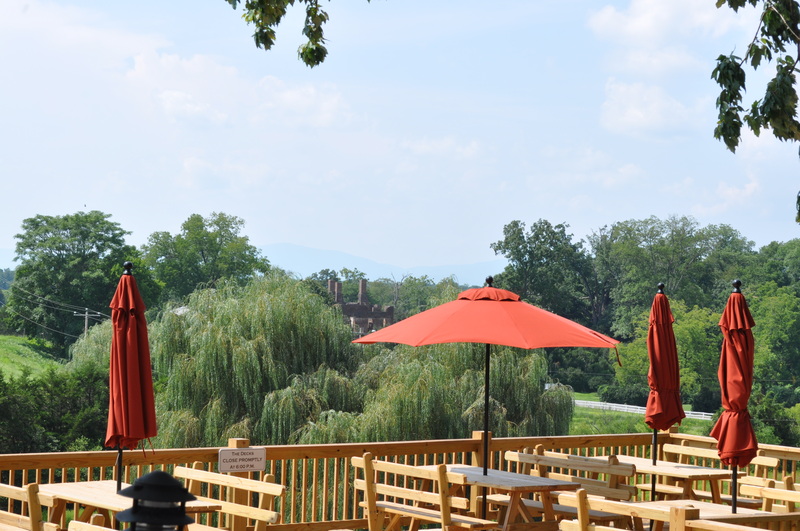 I am thinking about that summer trip to Charlottesville and the view from Barboursville. The octagonal ruins designed by Jefferson. Made me think of the tomato seedlings growing in my kitchen. All heirlooms from Monticello. Prudens purple, purple calabash and red fig. Hoping that this summer will be kind to my veggie garden, and not drown it like last summer. What signs of spring make you happiest? Flowers. Gardens. Outdoor activities. Grilling. Dining al fresco. That’s my short list. Posted in Adventures, Day Trips, Farms, Food, Gardening, Hobbies, Weather and tagged cooking, Food, gardening, heirloom tomatoes, hobbies, spring flowers. Bookmark the permalink. Time flies when you’re having fun. This week it’s been 14 years of living here. I actually find that hard to believe. Nine of those years I have been retired. Looking back I wonder where the time went and what did we do during those years. I was a city girl. Now, I just can’t imagine living someplace not surrounded by nature. I don’t miss the smog, the congestion, the hurried pace, the light and the noise. I really like the peace and quiet, and the darkness. Sitting on the porch on balmy evenings watching the sun set. Getting up early and watching the animals at the feeders and the bird bath. Battling the squirrels as they try to destroy my feeders. Moving the occasional snake. The first time I saw the sun turn the trees to “fire” I was hooked. We have been lucky out here. The chance to put up the radio towers for my husband’s hobby. The garden, for about eight years. Then I did have to move to the community space which keeps me involved with others in a social gardening setting. And giving me protection from the deer who tried constantly to defeat my fencing in the yard. I still put certain things in the small enclosed space in my yard, like potatoes, garlic and herbs. I have become a homebody. Not wanting to leave for extended periods of time. Letting the passport lapse for the near term. While decluttering, I found a box of old government papers that included many travel forms. I estimate I spent years of my career on the road. Easily five years, maybe more. I don’t miss it at all. We still take overnight or weekend trips but being cramped in an airplane isn’t my idea of a fun time. Give me a B&B in the country and good restaurants and I am happy. The outdoors and the weather drive our activities these days. There’s garden season. And the prime time amateur radio season. Let’s not forget mowing season. We fill our days with activities and projects, and keep relatively fit taking care of things. I also don’t think I would have gotten into cooking and baking if we lived in an urban environment. Certainly the way we eat has been influenced by the farms and family businesses in our area. Fourteen years have flown by. We are happy we took the plunge and moved out here, and look forward to many more years in our peaceful place. Posted in Birds, Commentary, Community, Food, Nature, Retirement, West HoCo and tagged birds, community, nature, retirement, rural life. Bookmark the permalink. Degrees. Fahrenheit. The lowest temperature here in the boonies, measured just south of us in Dayton at the RIMPO weather station. This was Thursday morning at 4:52 am while we were still all bundled up and warm, sleeping. I am so glad I don’t have to commute in this weather. At that hour, before retirement, my husband would have been leaving to catch the commuter bus. We haven’t ventured out much and we have been taking care of the birds and squirrels that live in our pine trees. I did find out that my bird bath heater doesn’t do ZERO degrees. The water was frozen Thursday. It was OK this morning so it hasn’t bit the dust. This is what it should look like. It was a solid sheet of ice and I did not try to take pictures in that temperature. It does pretty well in snow, like during Snowmageddon a few years back. Having fresh water is the most important service I can provide them. Since I have been stuck at home, I have been following social media using the neighborhood pages. Many requests for plumbers, or HVAC people. I have to say that periods of bad weather are not the time to go looking for immediate help if you haven’t already established a relationship, A plumber who knows you and your property will fit you in. Ken Griffin did a same day service call when we had a bathroom pipe freeze and break five years ago. Environmental Systems Associates has come in less than 24 hours when our heat pumps have failed. We use both of these local businesses for work when it isn’t an emergency so we aren’t looking for recommendations on line during a crisis. Right now it is still snowing. There’s at least three inches out on the benches. This wasn’t predicted to happen. Looks like tomorrow we will be clearing the driveway and the cars. I have to go pick up my monthly meat share delivery at the Wegmans parking lot at noon. Evermore Farm has about 20 of us on their delivery route throughout the area and I am fresh out of eggs. Looking forward to the chicken too. I pick up three dozen eggs, a chicken, and 7-8 pounds of Angus beef and Berkshire pork. I could have home delivery but this gives me an excuse to shop once a month at Wegmans. I think I will stop by Mother Natures in Snowden for bird seed. My supplies are dwindling. They are right down the road from Wegmans. Might as well make this an efficient trip. Posted in Birds, Community, CSA, Farms, Food, Local Businesses, Weather and tagged cooking, CSA, farms, Food, local businesses. Bookmark the permalink. It’s the dead of winter. Headed off this afternoon to pick up my farm share at my friend’s house, delivered by Lancaster Farm Fresh Cooperative. While snow flurries fluttered down on me. There are just a dozen of us participating in the winter 15 week CSA. Those winter vegetables aren’t fan favorites. Root vegetables mainly. Still, eating seasonally is something I committed to do eight years ago. Many people would turn up their noses at meals featuring basic root vegetables but I consider it a challenge to make creative dishes from them. I also like having fresh vegetables just harvested. Our CSA does a great job of mixing things up even when there isn’t a huge selection available. Here’s our first week’s basket. And what I did with it. With winter vegetables you may have them hanging around a while. Mine are stored mostly in cloth bags hanging in my garage or mud room. I can keep potatoes, turnips, onions, etc. for weeks as long as it is cool and dark. Carrots are always in the basket. There were one dozen red onions there. Little baby popcorn. Mixed winter radishes. Japanese sweet potatoes. Red beets. A treat – mizuna. An Asian green reminding me of mustard greens. Another special item. Scallions. It seems they are thinning them out as these were quite thin and delicate. 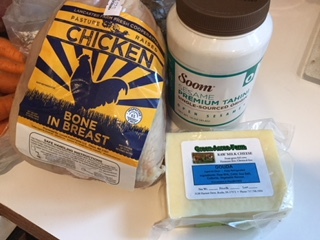 I “omnivored” my basket this winter, which added a cheese, a meat and a pantry item every week. The SOOM tahini is the best I have ever tasted. There was gouda. And a bone in chicken breast. I made Ina Garten’s herb roasted onions and added a few radishes to the sheet pan. I like her mustard based vinaigrette used in the recipe. Once I discovered roasted radishes, it is the way I use them most of the time. Mixing the onions and radishes resulted in a great side dish for the chicken. I put the chicken on top of the mizuna and baked it. Dusted with my homemade chicken dry rub. Mizuna was tossed with vinegar, oil and cayenne before putting it in the pan. Carrots and scallions are staples in my fridge. Those little orange carrots were split and roasted. Bigger carrots are sliced and boiled. Served with a butter sauce, or maybe a honey glaze. Carrots and onions also appear in soups and stews. I roasted the beets, peeled them and pickled them. As for the sweet potatoes, they are still in the mud room waiting for me to bake them and make hummus with that awesome tahini. Take your basic hummus recipe, add puréed potato and sriracha. Here it is now, week three of the CSA and there are a couple of items left from previous weeks. Mostly potatoes and onions. We have been getting mushrooms so I made beef mushroom soup today. Snowy weather always has me craving a warm bowl of soup. I had a soup bone from my meat farm share left which was just enough to make a quart of soup. Flavorful shiitake and cremini mushrooms. Spinach. Onion. Herbs. Simmered stove top for four hours. No wonder my electric bill is awful. All that roasting and cooking this month. I can’t wait for the first greens to show up but right now I have to dig around for some inspiration using purple top turnips and rutabaga. Sounds like another sheet pan dinner this week. The obligatory resolution list. Don’t we all make them? Do we keep them? I now tend to keep mine simple. Like continuance of my buy local, support small, buying strategy. And my continuing to rid our house of things we no longer need. That’s enough for us to handle. I looked at my dinner on New Year’s Day. Other than the mustard, everything was from local or small family businesses. Without trying very hard. It has been something we believed in. We use two local food sources for most of our food. Add to that, purchases from farms, country stores and local wineries. Dinner was: Evermore Farms pork, Pappardelle’s orzo from Secolari at Mary’s Land Farm, Trickling Springs butter, Lancaster Farm Fresh roasted red onions, and Gabriele Rausse Viognier bought at the Wine Bin. We believe in supporting our small businesses. Including local hardware stores, like Kendall and Clark’s. As for the decluttering. We keep looking for places to give our excess stuff. Does anyone want some Christmas decorations? All photography and written text on this site is Copyright of AnnieRie Unplugged ©2011-2018, unless otherwise noted. Material may not be duplicated, published or re-written without permission. All rights reserved.